Due to their innovative technologies, Pride Mobility Products is a global leader in their field. This allows them to bring users the best possible experience and enjoyment of a greater quality of life. The power wheelchair Pride 4Front does just that. The 4Front’s revolutionary design developed through extensive research in top suspension systems provides users with unprecedented comfort and ride quality. This is a suspension capable of addressing real-world needs. Power chair suspension that provided quality, performance, and safety along with optimized ride comfort was all on the top of user’s list of needs. With this in mind, developers of the power wheelchair Pride 4Front dug deep into research of top suspension systems in a myriad of industries, especially automotive. This enabled them to create and evolve the technology that is now the Smooth Ride Suspension system (SRS), the top feature of the 4Front. An advanced stability makes obstacle transitions smoother to provide a ride quality like no other. 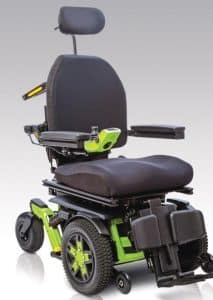 Using automotive grade components and engineering, this power chair offers an ultra smooth and quiet experience, providing all of the lift necessary for users to address their daily lives in the most comfortable and accessible way possible. Orthopedic Service Company puts its focus into providing customers with the greatest mobility experience that make daily life easier, safer and more accessible. We proudly offer you the power wheelchair Pride 4Front and its true quality ride. Contact Orthopedic Service Company today and talk directly to one of our mobility specialists who will guide you towards the best mobility solution that adjusts to you.